Why can’t we just play nicely? My son David is one of about 600 bright, enthusiastic young people in Chicago who have essentially given up their personal lives for the past several months. They work 12 hours (or more) a day, seven days a week, hoping their sacrifice will result in the re-election of President Barack Obama. David is a research associate for campaign. He spends his days glued to a computer screen, prowling the Internet for facts and figures to shore up campaign strategy and poke holes in the opposition’s. Once the third and last presidential debate has concluded, he will be sent to the field, where he will spend long days knocking on doors and encouraging people to exercise their right to vote. My sons are tough competitors. 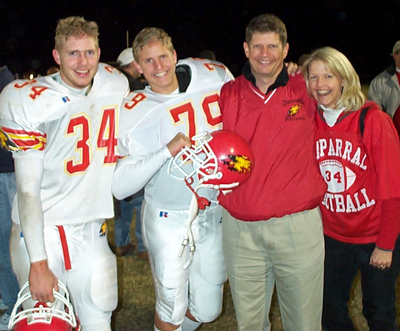 They both played high school football; Andy continued through college. David also played lacrosse through high school and college. These guys are not afraid of hard work. They’ve both been down in the mud and the dirt, pushing with everything they have in them to benefit their team. They’ve both experienced thrilling victories — and their fair share of bad calls, disappointing losses and personal injuries. They are strong. They are self-aware. And, like their dad, they are deeply analytical. So I know that they will weather this election, whichever way it goes. As their mother, there is little I can do to help them. It feels just like those days when I sat helpless on the high school bleachers, admiring them for taking on tough challenges while hoping with all my heart that they would not get hurt. In those days, I showed my support by making “Game Day Pancakes” packed with flaxseed and oatmeal. With other moms in the booster club, I served spaghetti lunches on Friday afternoons. I transported endless flats of Gatorade to grassy fields, bought more team T-shirts than I could possibly wear and put the resources of my magazine to work creating beautiful team programs for each new season. 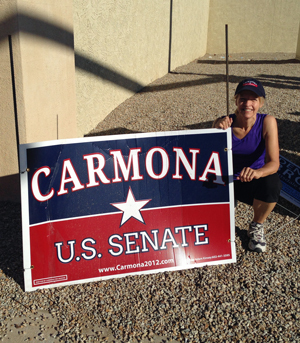 This election season has many parallels to what I remember from those days on the field. Often, my sons were pitted against boys with whom they’d grown up. Playmates on the playground were now enemies on the yard line. The mothers and fathers of those “enemies” were friends of mine. It was always awkward to run into them before the game started, before we headed our separate ways to bleachers separated by wide fields of green. I wanted my sons’ teams to win; I wanted their sons’ teams not to lose. I longed for those early days of T-ball, when we were all in this together. When the goal was learning a skill and expanding horizons, not taking score. Many of us are disheartened by the ugliness of these last few, down-to-the-wire campaign weeks. It is discouraging to read, as I did in this morning’s paper, that it is impossible to cut through the glut of messaging to gain attention without going down and dirty. It sickens me to realize what that says about our society. Politicians have no choice but to “go there” to win elections. We, the electorate, apparently demand that of them. Must we also expect it of ourselves? This season, perhaps because my sons’ involvement has me more tuned in than ever before, I’ve been most upset about the pettiness exercised by individual citizens. Some misplaced sense of entitlement disguised as “supporting the team” has turned ordinary people into thieves and vandals. 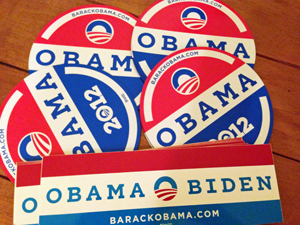 Several months ago, David bought me a magnetized “Obama 2012” sticker for my car. I displayed it proudly. To me it wasn’t just showing support for the president; it was showing support for my son. 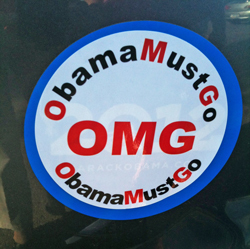 One day, while I was camped out at a coffee shop editing magazine articles, someone slapped a sticker with an “Obama must go” message over it. On another day, while my car was parked in the underground garage at my office, someone removed the magnet sticker entirely. Apparently his (or her) right to thwart my right to freedom of expression justifies theft. I was so furious I went home and ordered 10 more — and 10 bumper stickers, too. My husband and I participated in the Walk to Stop Diabetes on Oct. 6. Part of the route headed south on Central Avenue, where we were dismayed to see that two campaign signs for an Arizona legislative candidate had been purposely bent to the ground. Dan and I stopped our walk to right the signs. 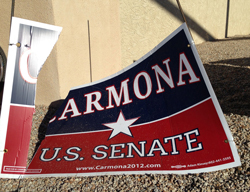 On my way to work recently, I noticed that someone had taken box cutters to a “Carmona for Arizona” sign on a busy intersection on Scottsdale Road. I stopped at Walgreen’s on my way home to purchase duck tape. The next morning, I popped the roll of tape onto the handlebars of my bike and threw a pair of scissors in my Camelbak. My husband grabbed a hammer. We rode our bikes to the intersection, where he re-pounded the rebar firmly into the rocky soil and helped me hold the sign pieces so I could tape them back together. I used to be embarrassed when families on my side of the field would “boo” the opposing team. Those earnest guys on the field weren’t usually guilty of anything but being members of the opposing team. They were good guys, too, hardworking guys. Guys with parents and siblings who loved them and didn’t want them to fail. I’m sure that’s true of candidates, too. At root, there has to be a lot more than ego guiding a person’s decision to run for office. Who would put themselves through this if there wasn’t some higher purpose they hoped to achieve, some sense of duty to sacrifice self for the team? But that’s not the world we live in. We allow no room for gray area, for meeting each other halfway. You’re either a good guy or a bad guy. We, the electorate, are left with little but mud-slinging and innuendo to guide our decisions. We’re all too lazy to do the real work — the thinking work — that should guide such monumentally important decisions. Someone must win; someone must lose. The team that wins isn’t always the most deserving. That’s life. Because of sports, my sons learned these lessons early. They also learned how to toughen up, to withstand criticism. To know what they stand for and not let what others think affect them. You may disagree with their candidates, or with our family’s politics. You have every right to choose a different path. I respect that. I just hope that, when we exit the field, we can put the boos and cheers behind us and accept the outcome with grace. This is my personal blog — a place where I can remember, ponder, sort out and come to terms with the events of my life. As publisher, editor and founder of RAISING ARIZONA KIDS magazine (since 1990) I also write feature articles and a blog about stories "Behind the 'Zine."